Back in my early University days, I would visit Rich Guy in West Van quite often. We often spent our time figuring out what new modification we'd do to our cars. Actually, I don't think I got over that phase... Anyways, at other times, we were trying to one-up each other in Mario Kart. Yes, those were the days... Then out-of-the-blue, he whipped out an odd contraption that required manual cranking to create shaved ice from a whole block. We watched him go through the motions as the block of ice flew off into the corner every now and then. 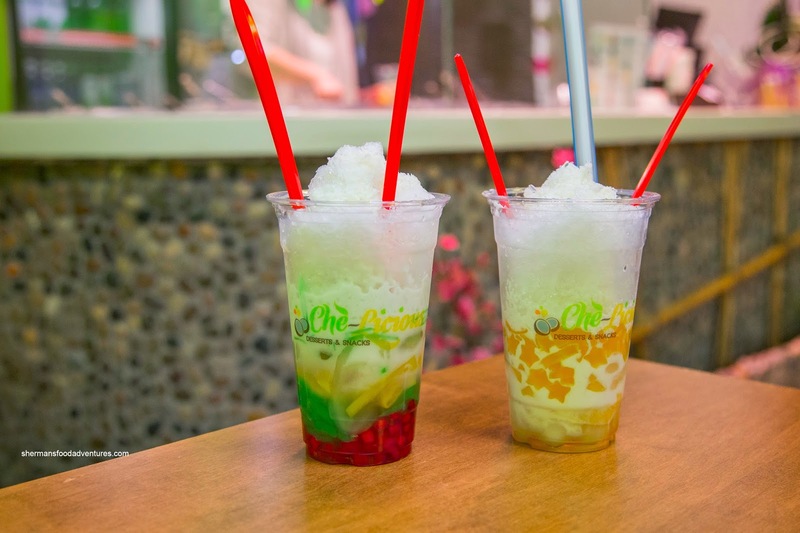 With a pile of shaved ice, he put in in a tall glass along with many different ingredients including coconut milk, palm seeds, different coloured jellies and palm sugar. Suffice to say, I enjoyed this "Cendol" very much and went on to enjoy all the Southeast Asian versions. 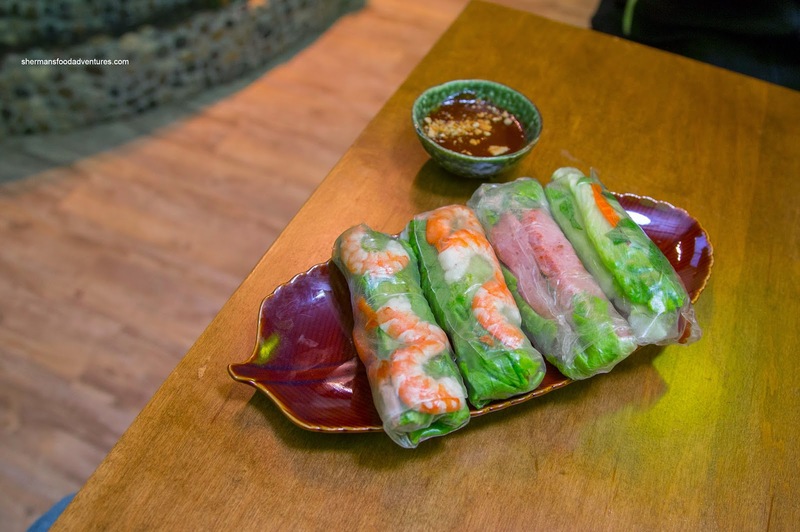 Other than sampling them in actual restaurants and some Banh Mi joints, there aren't a whole lot of places that serve them as their featured item. 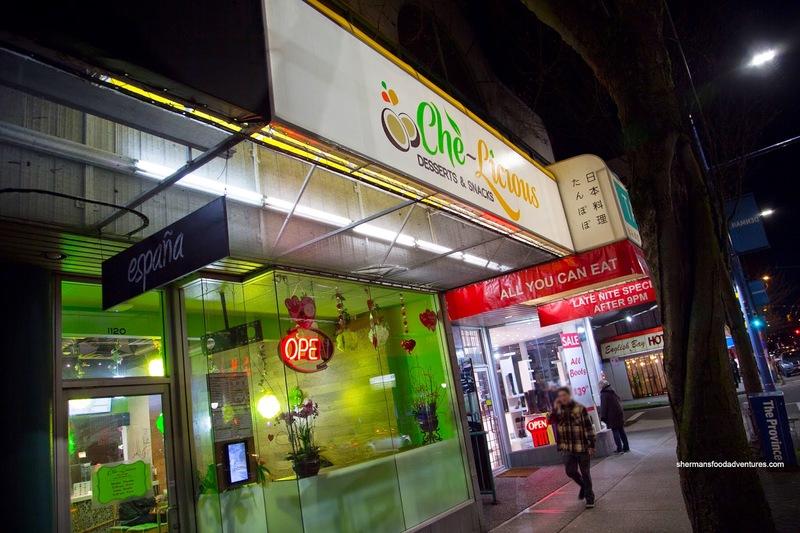 However, the new opened Chè-Licious Desserts & Snacks on Denman offers up the Vietnamese version (Chè - hence their name) along with some Banh Mi on the side. With no further delay, let me get to the Chè... We tried both the Special (Pandan jelly, agar jelly, pom pearls, toddy palm, jackfruit, longan, coconut milk) and So Fruity (Lychee, longan, jackfruit, mango jelly, palm seed, coconut milk). Although initially very sweet, it got progressively better as the ice melted. In fact, we thought the desserts/drinks were nicely balanced. As evidenced in the picture, they were not shy with the ingredients. We had 2 each of the Rollin Classic and Pork Bomb salad rolls. With a chewy rice paper and fresh ingredients, these were decent. We did find the dip a bit on the sweeter side with a dominant hoisin flavour. 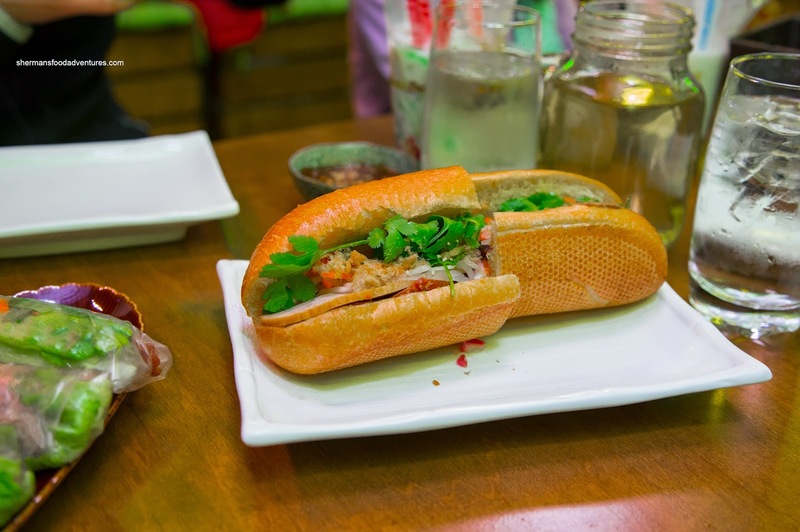 Onto the Banh Mi, we had the Saigon Signature consisting of cold cut meats, BBQ pork, pork floss, pate, pickled daikon and carrots, house-made mayo, cucumber and cilantro. Stuffed with a generous portion of meaty BBQ pork, Vietnamese ham and pork belly (although not enough pork belly for the entire sandwich), this was hearty and filling. The pate was sufficient and peppery while the pickled veggies had enough acidity to balance off the flavours. As for the bread, it was light and crusty. 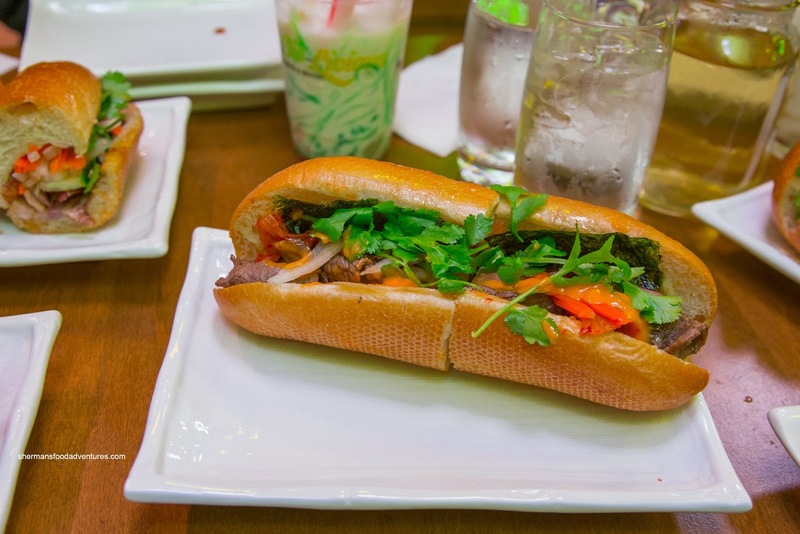 A very decent Banh Mi if you ask me. I would've liked to add a few drops of Maggi, but my son didn't like that idea... Next, I tried the Heo Yeah! made with crispy skin roasted pork, pate and the same accompaniments. Fatty and succulent with bits of crackling, this was another solid sandwich. The addition of pate was necessary to add another flavour component. We had something a bit different in the Seoul Savoury consisting of Kalbi beef, kimchi and seaweed strips. Interestingly, we liked this sammie the best as it was full of tender and well-seasoned beef. There was some spice to go with the tang of the daikon and carrots. 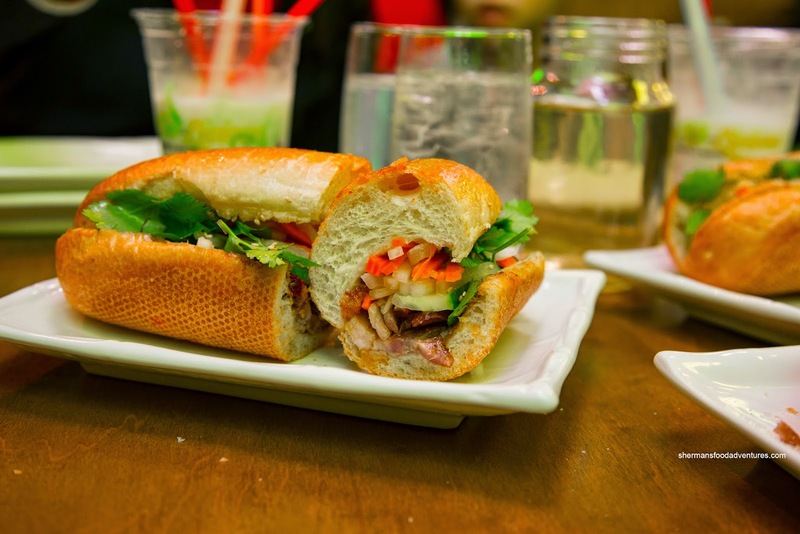 It really did taste like a Korean-inspired Banh Mi without going too far. Lastly, we tried the Ducking Good with roasted duck, ginger, scallion and hoisin sauce. 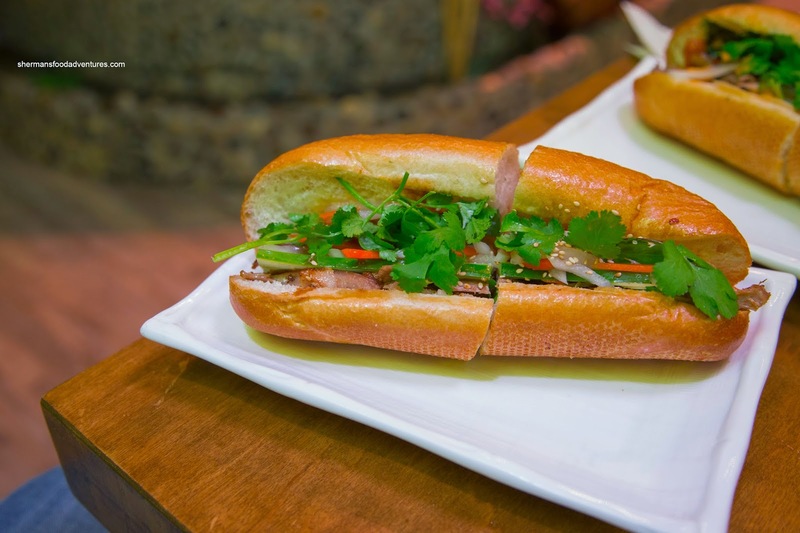 This one had all the classic elements of a Peking duck warp with the addition of the classic Banh Mi condiments. Hence, it tasted as such. We would've liked to see crispier rendered skin, but that may have been hard to do if the duck wasn't made in-house. Overall, we enjoyed our visit to Chè-Licious even though there might be a slight sticker shock for some people. However, one must consider their location and the types of ingredients they use. Furthermore, the stuff we had was good and I personally prefer it over DD Mau in Yaletown. I hope this is not too late!! But you have another hour left to purchase a deal at Che-Licious on Social Shopper!! I bought mine last week and will be going on the weekend :) I wanted to get the Shrimp Bahn Mi but reading your post makes me want to try the Kimchi Beef! !